Follow in the footsteps of Emily Carr, from the Gorge Waterway to Port Renfrew where the rain forest meets the sea. 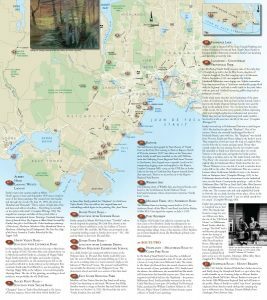 Visit the sites she sketched and painted during the most productive period of her life (1927-1945). Read her letters and literary works which help to identify these sites. Remember that in Emily’s lifetime the West Shore was still a densely forested, wilderness area and popular holiday destination for Victorians. Emily’s sketching trips were limited mainly to the outskirts of Victoria. For fifteen years she camped out in cabins, tents, log huts, tool sheds, lighthouses, boathouses and garages. 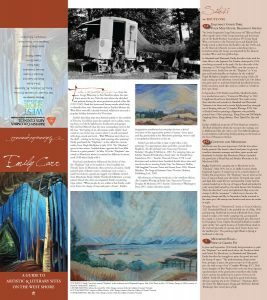 She told Ira Dilworth that the most outstanding event in her life was: “the buying of an old caravan trailer which I had towed to out-of-the-way corners where I sat self-contained with dogs, monk and work – Walt Whitman and others on the shelf – writing in the long, dark evenings after painting”. Emily purchased the “Elephant”, as she called the caravan trailer, from Hugh McAlpine in July 1933. In June and September 1936 Emily had permission to park the “Elephant” in a small wood above the Producers Sand and Gravel Pit, Metchosin. In Hundreds and Thousands, Emily describes her struggles to paint the gravel pits and the beauty of space: “The predominating characteristic here, perhaps, is space, the great scoops out of the gravel pits, the wide scoop of sea”. 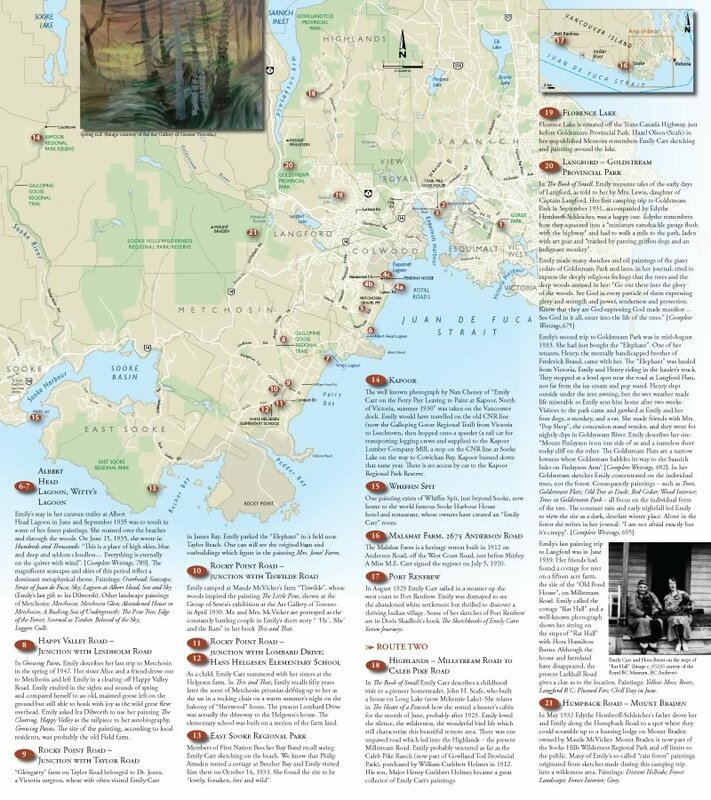 This guide was created in 2011, a pet project of Elaine Limbrick, then President of the West Shore Arts Council. 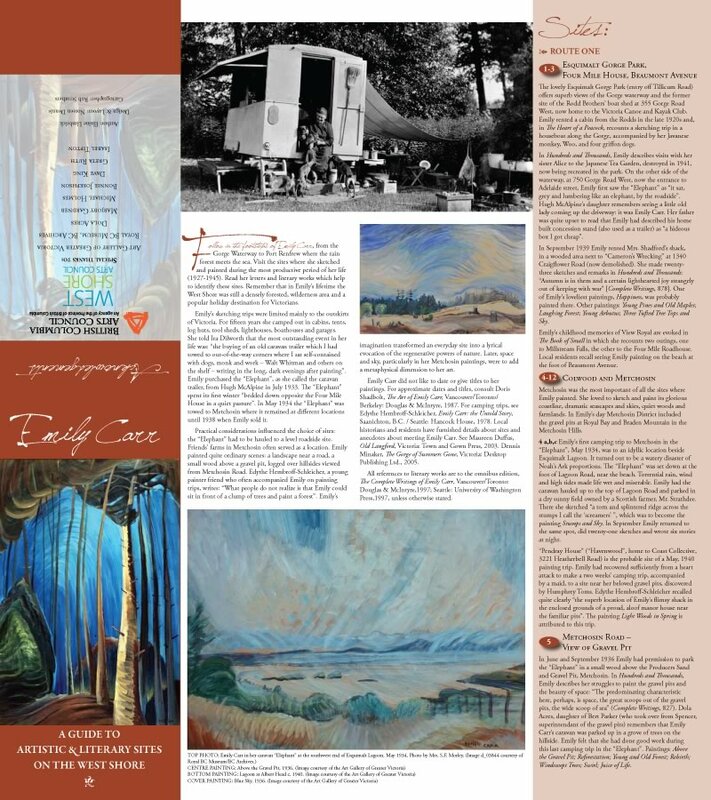 Read the Goldstream Gazette story On the Hunt for Emily Carr.